OK, so I wanted to tweet, email, and comment to HBO, Sundance, and UK Channel 4 facts showing how implausible and noncredible Wade Robson and the documentary are, for example: Robson's participation in Michael's funeral, Robson's testimonial in court in 2005 etc. (similar to what Taj is tweeting currently). But I noticed it takes a lot of time to research everything in a way that is easy to post and tweet and comment etc. So I thought it might be a good idea if we as a community collect such facts together and then tweet and email and comment those to the involved people. This would have two positive effects: We would show the responsible people that this so called documentary is a piece of very bad journalism and secondly we would also show the public how noncredible these accusations are. What do you all think? I would find it really helpful to defend Michael.
" 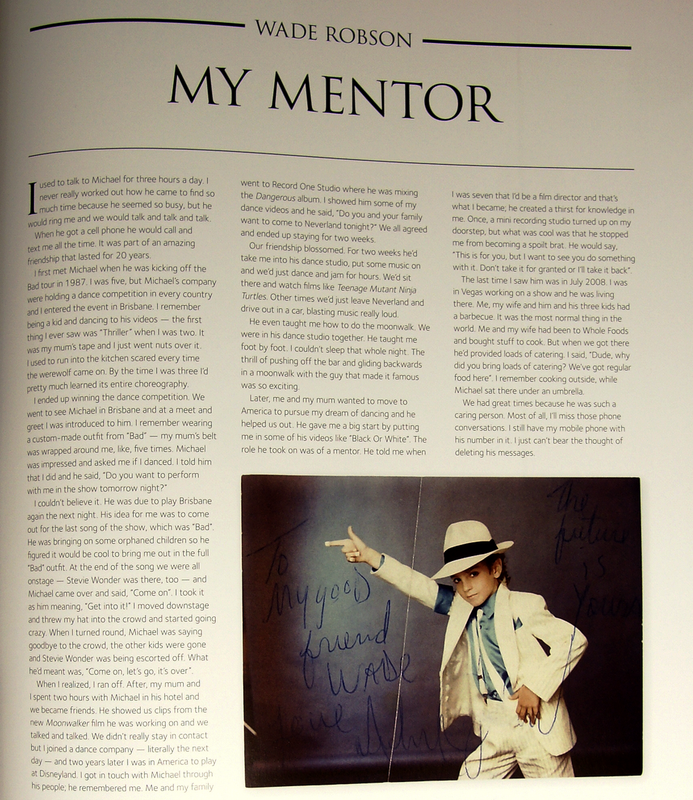 [...] Michael Jackson changed the world and, more personally, my life forever. He is the reason I dance, the reason I make music, and one of the main reasons I believe in the pure goodness of human kind. He was a close friend of mine for 20 years. His music, his movement, his personal words of inspiration and encouragement and his unconditional love will live inside of me forever. I will miss him immeasurably, but I know that he is now at peace and enchanting the heavens with a melody and a moonwalk." Robson claims Michael molested him between 1989-1996. Michael was investigated in the Chandler case in 1993. Robson wants us to believe Michael molested him while under criminal investigation? Robson spoke glowingly of MJ from 2005-2011 and even did tributes. Robson and his wife had MJ and his children at their barbecue in 2008. Robson wants us to believe he lied under oath when he put his hand on the Bible in MJ’s criminal trial of 2005 and said MJ had never touched him. If so, he would have committed perjury. Why would he do that? There's absolutely no chance HBO, Sundance, and UK Channel 4 will pull the documentary. But even so, I completely support this cause/concept. The more legitimate facts we can toss into the world, the better of a chance we'll have at pulling some people out of the dark side. Robson's credibility isn't shaky or questionable, it's absolutely nonexistent. His timeline is illogical, his testimony completely contradicts James Safechuck's, and the sequence of events that led to the full accusations — audition for a slot in the MJ Vegas show creative team, get rejected, file lawsuits against several enterprises, lose them all, shop around a tell-all book, get rejected by every publishing company — is a clear indication that Robson's motive is money. I don't care if you believe Robson/Safechuck or not. Any objective person has to look at that information and say, "That's concerning." Anything I can do as far as retweets, posting, contributing to a project, etc., I'm ready. I'm sharing this link with as many sites as I possibly can. Last edited by CherubimII; 18-01-2019 at 05:15 PM. Give me a freakin break!!!!! Robson was a grown man when he gave his testimony in MJ's 2005 trial. How the heck can he say, with a straight face, that he didn't know that sort of alleged abuse was not wrong. Keeping in mind, that his attorney at first said that it was "Repressed Memory." I guess that didn't sound reasonable to them, so they changed it to something even more ridiculous. Q. YOU'RE AWARE OF THE ALLEGATIONS IN THIS CASE, ARE YOU NOT? Q. And are you aware, as you sit here today, that there's been allegations that Mr. Jackson molested you? Q. IS EVERYTHING YOU'VE SAID THE COMPLETE AND HONEST TRUTH? it's not that HBO and Channel 4 don't know that this documentary is full of lies.. they just don't care..
cause bad news and scandals sells. That fool Robson's words are like found gold. Talking about not wanting to get rid of the messages from MJ on his cell phone AND being at a Bar-B-Que with Michael and his children, while both families were living in Las Vegas. What a freakin idiot!!!!! Everything that proves what a liar Robson is, can be found in his "MY MENTOR" addition to the Opus Coffee Table Book. Seriously, who does this? Tell me one victim who invites his//her abuser to a family barbecue and I'll give him a benefit of the doubt.